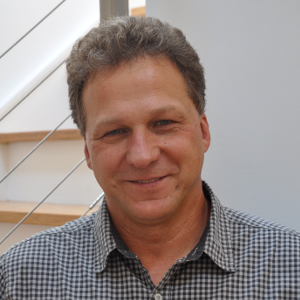 There are many famous architects that have produced fabulous works in the Hudson Valley. Most recently Frank Gehry’s Center for Performing Arts at Bard College was completed. Frank Lloyd Wright designed 3 houses in a community called Usonia in Westchester County. 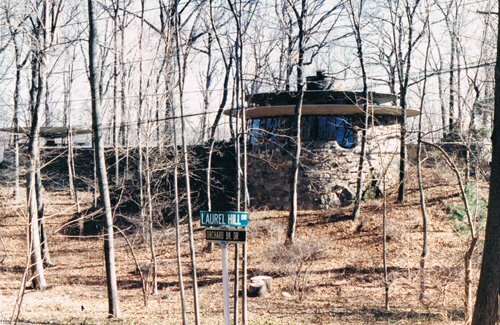 Perhaps the best known of the three houses is the Friedman, which is sometimes called the Mushroom House. 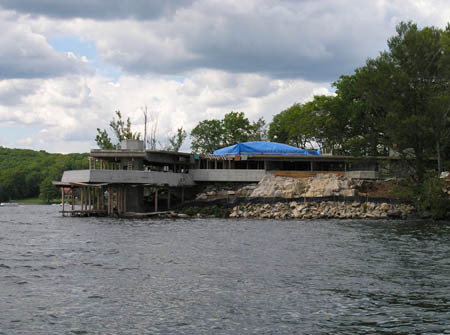 Only a few years back, a house Frank Lloyd Wright designed was constructed on an island on Lake Mahopac. I met the son of the man who commissioned Frank Lloyd Wright to design the house. He was looking to sell the drawings and was wondering about their value. An Intern at an office where I worked took pictures of the house while it was under construction. 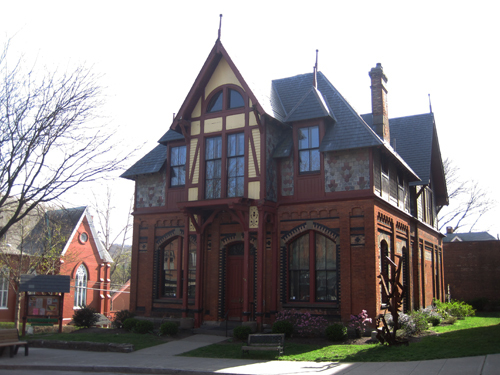 The City of Beacon is home to the beautiful Howland Cultural Center (formerly a Library) designed by Richard Morris Hunt and a residence designed by Calvert Vaux. Buildings from McKim, Mead, and White, Richard Morris Hunt and Andrew Jackson Downing all have a presence in the Hudson Valley. There is no shortage of estates sprinkled throughout the Hudson Valley. Some of the better known ones are: Kykuit (Rockefeller Estate), Olana, Boscobel and Van Cortland Manor. These fine works help establish the identity of our region and it is wonderful to have so many to view and experience, but they create only part of the fabric of the Hudson Valley. I think the other elements that make the Hudson Valley an extraordinary place are America’s First River, our beautiful landscape and it’s Vernacular Architecture. The natural beauty of the Hudson River and the surrounding landscape is easy to understand, but what is Vernacular Architecture? Simply put vernacular buildings were designed and built without the influence of an architect. Most of the buildings built over the centuries of humanity are vernacular. Some of the other labels for Vernacular Architecture are: indigenous, rural, anonymous and ‘non-pedigreed’ architecture. Years ago I read a fascinating book called Architecture Without Architects by Bernard Rudofsky. It provided a definition for Vernacular Architecture that was quite thought provoking. I don’t think I agree with every word in the first sentence of Bernard Rudofsky’s definition, but I think we have lost “the origin of indigenous building forms and construction methods” in the Hudson Valley. The natives that roamed the Hudson Valley before Europeans settled it didn’t build great monuments to themselves or their culture. There is little evidence of their prior existence. European settlers built what was familiar to them and because of that we have a variety of architectural styles present in the Hudson Valley. Perhaps the most notable style is the Dutch Colonial, but there is no shortage of Greek Revivals, Carpenter Gothic, Italianate and other styles. The focus of this article is not on the styles, there are many better sources of information on the styles. I’m interested in the architectural forms and methods of construction from the past because I think they added so much to the character of buildings in the Hudson Valley. Brick Factories once were a major employer throughout the Hudson Valley. DPBW, Dennings Point Brickworks in Beacon was a major producer of bricks that were used in Beacon and in New York City. 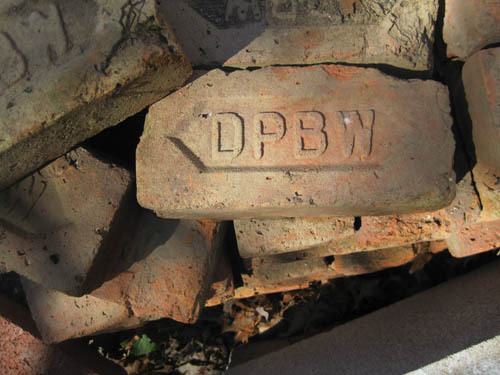 When I dig in my yard I find bricks stamped DPBW. I even managed to hook a brick while fishing on the river. If you walk along some of the Hudson’s shoreline in Beacon you will see sections of beach of small smooth rounded edge orange/red pieces of brick. Our first house was made of bricks. The construction that was used was true brick construction. This is not how we use brick today. True brick construction limited building heights and allowed for creation of interesting brick details. 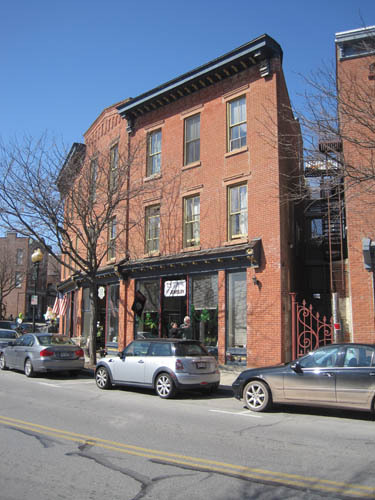 Most of the buildings on Main Street and many of the homes in Beacon and throughout the Hudson Valley are constructed of bricks. Many of them are beautiful and who knows who designed them. If you were to compare the commercial buildings on Main Street in Beacon, built years ago, to the contemporary development of route nine, I think it’s clear we have lost a form of the past. What is awesome about the way it used to be in the Valley was that we built with local materials. Today, I regularly see the Chelsea Forest Products trucks loaded with large amounts of Canadian lumber. The use of locally available materials and construction techniques help define what so many of the buildings in our towns looked like. If you would like to read more about Hudson Valley brickyards there is a great site http://brickcollecting.com/dj.htm created by Don Bayley . So many people who move to or have weekend houses in the Hudson Valley want a “Farmhouse.” The Hudson Valley landscape was once filled with working dairy and fruit farms. As with so many parts of our country, farming has been disappearing and is nearly extinct. I think this is a horrible and most likely irreversible trend and a terrible loss to our culture as well. What happens to all the old farms? In the Hudson Valley some are turned into sub-divisions of low quality houses which mimic farm houses, some are turned into fabulous homesteads, and some have their development rights purchased, which helps the farmers and preserves the landscape. Back in the day, the main means for building wood structured farm houses was post and beam construction using hand hewn timbers, which were often locally harvested. Whether the houses were extravagant or simple, most of them had this construction method in common, as did the barns in the region. In some cases parts of the post or beams were left exposed or partially exposed and that in combination with wide board plank pine floors, handsome finish carpentry and good proportions, created a look and feeling that people today still love. Many people looking to build new homes want to incorporate these characteristics into their projects. But for a variety of reasons- cost, codes, availability of local products, etc., building a truly vernacular structure may not be reasonable. True post and beam construction using local materials, which was once the primary means of building structures, is virtually extinct. I did have the good fortune of working on a project in Clinton Corners where we rebuilt the interior of a barn that was attached to a farmhouse. 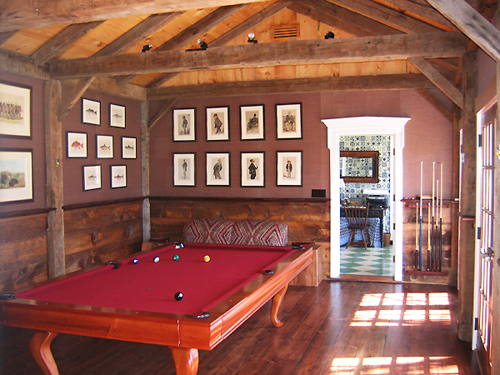 In this project we emphasized the rebuilt post and beam construction, which made for a really cool Game Room and provided the clients a true taste of vernacular architecture. Does anonymous architecture really matter? Things change and the world is getting smaller, we may have better ways of building today. Materials are relatively easily transported and most regions could no longer harvest all the materials necessary with which to develop. Our culture is very transient-people are no longer as strongly rooted to their birthplace. Many of the Hudson Valley’s residents are transplants and/or weekenders from New York City. What can be gained by studying the regions vernacular architecture? Many of the vernacular structures had charming visual details and people still find them appealing. In the past people did not have available to them the types of mechanical or electrical systems we have today and they had to create buildings that worked with the local climate. Builders often used simple strategies to maximize daylight or create air circulation. Some of these strategies are worth employing today so that we can minimize the energy consumption of our buildings. An Olive Garden or a Home Depot are more or less the same whether they are in Knoxville, Tennessee or Fishkill, New York. In this case the corporations are dictating what we see in our landscape and they are homogenizing it. In the past it was the local people often working together that created the buildings in the landscape. I imagine there was more accountability for what was built and maybe higher standards because if you created something ugly, your neighbors might have something to say about it. Our forbearers in the Hudson Valley, perhaps with minimal outside influence, used local materials and building techniques to create buildings and the conglomerate of buildings within our precious landscape resulting in a distinctive character not found anywhere else. When you think of the places people enjoy visiting, such as New Orleans, they are liked because of the unique charm and character created largely by the vernacular architecture. As an Architect practicing in the Hudson Valley, I spend a lot of time thinking about how to accommodate our contemporary building needs with what is and isn’t appropriate in our region. How can we develop in a way that maintains the character of the Valley? I’m not so sure I have the answer, but I try to address it in my work. I know that if I worked in Las Vegas or Los Angeles, the work I produced would be something altogether different. Very interesting article. I was thinking about vernacular architecture the other day when I noticed a group of stone houses in Middletown, NY. I guess you can’t get more local materials than that. I wonder if that form fell out of favor due to lack of stones, this seems hard to believe. Found your post excellent. Thank you for your definition of vernacular and all the pictures and construction methods! I love Hudson valley vernacular buildings! I am happy you enjoyed the post. There is no shortage of neat old buildings in the Hudson Valley.